Michael Singer Studio led the architectural design of the exterior of the 50,000 square foot Market and the landscape design for the rehabilitation of the existing shopping center site at Mandarin Landing. The entire west entry façade is designed as an apparatus to capture the strong Florida sun and filter this natural light throughout the interior of the store. To accomplish this, large angled three storey tall fins are placed along the façade to intercept and reflect the light into the recessed tiered levels of glazing. The top level of glazing is made of specially fabricated colored glass that further filters and softens the light, and also emits a colorful glow from the building in the evening. This light capturing strategy, in conjunction with the heavily insulated reflective roof, reduces heat gain and results in less energy used for mechanical systems cooling. Wrapping the south, west and north facades is a large curving canopy awning that protects the store entry and also shelters an outdoor café seating and garden area. The awning is punctured with skylights and structural steel ladder columns covered with flowering vines. 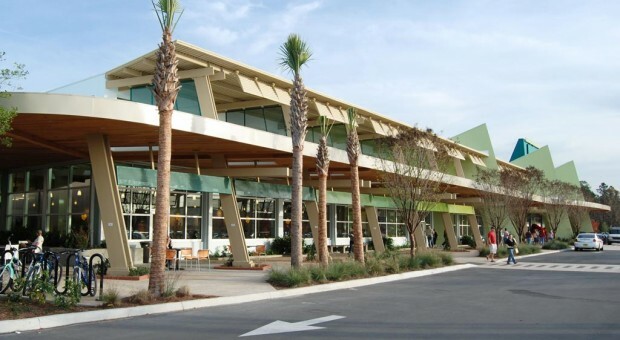 Reclaimed Florida cypress wood was selected for the exterior building canopy awning underside. Long horizontal perforated and colored steel screens are hung from the awning and the rooftop overhang, adding additional filtration for the natural light. The facades also have large areas of steel cable trellis for living walls of native vines that provide increased insulation, reduce the heat gain from sun shining on the walls, and provide habitat for birds and butterflies. There are several other environmental design aspects to the building. A rainwater cistern collects water from the roof and stores the water for irrigation. Native and low water landscaping is used around the building and throughout the shopping center property. Naturalized retention ponds within the shopping center are planted with native species, providing habitat for birds and filtering storm water. Light colored paving around the building was selected to reduced heat gain.